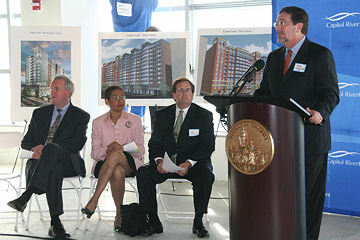 On October 22, 2007, the Capitol Riverfront Business Improvement District held a kick-off event on the 10th floor of 20 M Street; here, Mayor Fenty addresses the crowd. 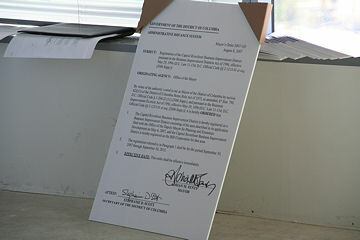 The BID covers all of Near Southeast and Buzzards Point in Southwest. Michael Stevens, the executive director of the BID, addressing the crowd, with Council Member Tommy Wells, DC Delegate Eleanor Holmes Norton, and Chris Smith of William C. Smith looking on. Behind them are renderings of JPI's projects at 909 New Jersey Avenue and 70/100 I Street, both currently under construction. 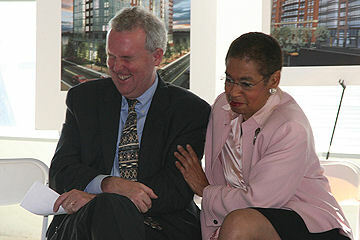 Tommy Wells and Eleanor Holmes Norton share a giggle after Michael Stevens promoted Wells to "Congressman." A wide shot of the "dais"; you can see the ballpark through the windows at right, over the shoulder of Greg O'Dell, chairman of the DC Sports and Entertainment Commission, the agency responsible for getting it built. 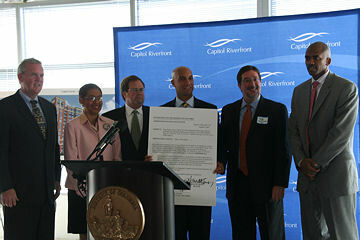 Mayor's Order 2007-183, officially registering Capitol Riverfront as a BID. No ground to break at this ceremony, just the mayor wielding a pen. One of the BID's major functions is to keep the neighborhood clean, which will be quite a task during all the on-going construction. The first graduates of the "Clean Team" program got their diplomas, and a photo op with the Mayor and Mrs. Norton.